It's not every day that we feature individual guitarists on our website. But then again, it is not every day that a guitarist is so blown away by the Plek process that he feels motivated enough to create a series of videos about his experience. But that was the case with Australian guitarist Leon Todd. He's a professional performer and teacher from Perth in Western Australia. After hearing about the new Plek machine at MT Guitars, he took his "least playable guitar" - an old Greco Les Paul copy - round to see what the Plek process could do for the instrument. One of the important things that Leon says that he learned from the process, is that "The Plek isn't a magic fix. It's a tool to aid a luthier. 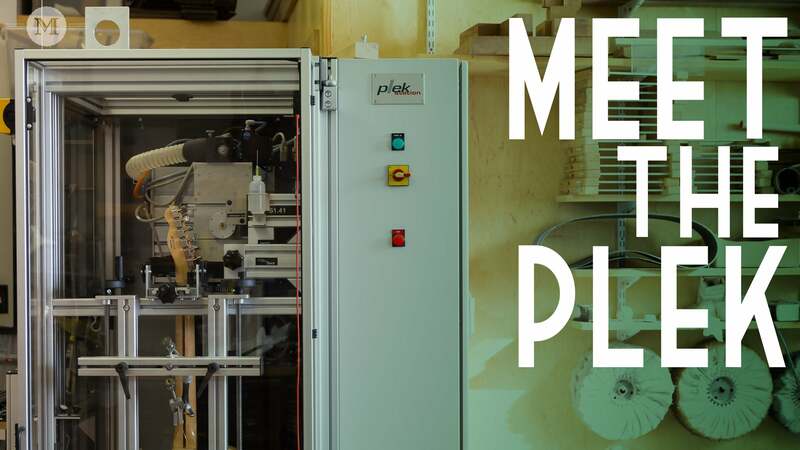 So the Plek is only going to be as good, as the luthier who's using it." Lucky then that it was Tim Thompson, owner of MT Guitars, that Leon took his guitar to. Tim is a talented luthier who has Plek'd literally hundreds of guitars since acquiring his Plek machine in late 2016. Leon was so impressed by the results of the Plek process that he subsequently took a bunch of his other guitars around to MT Guitars to have them Plek'd. His old, neglected Greco "Now plays as well as any guitar I have on my wall. And believe me, I have a lot of guitars." You can check out Leon's other Plek-related videos here, on his YouTube channel. And if you live in Western Australia, you can contact MT Guitars either via their Facebook Page, or by telephone: +61 438 346 394. Tell us about your musical history. Your band is a heavy metal band, right? In America they have radio stations called "active rock", which is like heavier than the rock music you hear on normal FM stations, but it's not really what you would call metal. It's more like rock songs with really big chunky guitars, so we kind of sit in that no-man's land between hard rock and metal. We're always either the heaviest band by a long way on the bill, or the softest band by a long way. You guys should go to Wacken. Do you know Wacken? Oh dude, I would love to go. It's always amazing just to see the line-ups there. I was very impressed with your shredding - I enjoyed your videos also because of that. It was really good to see you with these guitars that had been pleked and taking them for a test drive. So tell me a little bit about what you personally are looking for in a guitar. I was really lucky growing up. My dad played guitar, and he's been building guitars since basically before I was born. That was his passion project, and he had a lot of friends he would build for. So I kind of grew up in this environment where the guitar was everything. So naturally the last thing that I wanted to do was to play guitar (laughs). And when I was around 14 I was listening to the Scorpions, and Rush, and Thin Lizzy and bands like that, so I have always liked really melodic music, really heavy music, and anything with either really interesting musical concepts or really great technique. And obviously I had the resources of bodies and necks, and parts lying around, so I could modify my own guitars and I got into that really early. I built a strat, just from parts that were lying around, and I had this Bill Lawrence pickup, because I read that that had the highest output, and then I put the biggest frets possible on it, just a classic teenage thing, because I wanted the biggest and best. But for me, primarily what I am looking for in a guitar is just something that is inspiring to play. I'm a massive guitar nerd, but ultimately the things that I like the best are the things that make me stop thinking about that. That's really the basics, and that's what got me with the Plek thing. There's so much misinformation, and so much mythology, and sort of voodoo around guitars and tonewoods and such. At university I studied mathematics and statistics, and so I've got that sort of hard science background - so any time I hear anything like that I want to collect data about it.... So it's great that I can take a guitar in to Tim at MT Guitars and say "Hey, I really love the way you've set this guitar up, everything about it really inspires me to play, what have you actually done? And he will bring up the data sheet..."
So he shows you the scans? Yes, he's great. He'll go: the reason you don't like this guitar is that the action is not what you're used to, plus it's got a big ski jump and has a twist in the neck. It's really cool because I own so many guitars - over 40 guitars - but with certain guitars I have these suspicions that no matter what I do them, they never feel right to play. And Tim will go, yeah, it's due to this twist in the neck, or whatever, and you wouldn't be able to level it off. To me it sort of boils down to that golden combination of being the right weight and having the right setup. I'll basically play anything if it is setup well now. I've got some really cheap import guitars that have been setup with crazy low action and consistent frets and they sound good. So I guess I've almost found what I'm looking for now. Leon, that's great. Thanks so much for talking to us and for taking the time to make your videos!